Skipping your morning breakfasts because porridge sounds boring? Well, not anymore! 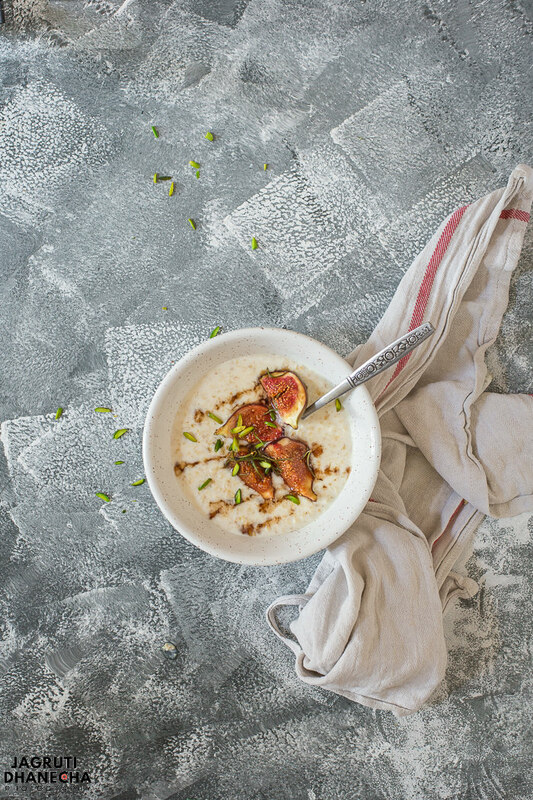 Jazz up your morning by preparing this deliciously creamy and dreamy Fig and Mascarpone Oat Porridge! A recipe with oats, autumn fruit Figs, nuts, herbs and mascarpone, a well-balanced breakfast that will help you keep full and energised until the lunchtime. I and hubs can't get enough of the oat porridge, we love its simplicity. Almost 5 days of the week we like to have an oat porridge bowl for our breakfast. I make our oats porridge with skimmed milk and topped with multi seeds, nuts and one seasonal fruit because there is no better time to enjoy a perfect warm bowl of warm and toasty porridge when the days get cooler. In our family, we prefer having seasonal veg and fruit, when they are in the season and abundantly available. Currently, our markets and shops are filled with figs, fresh and tender, just how we like. 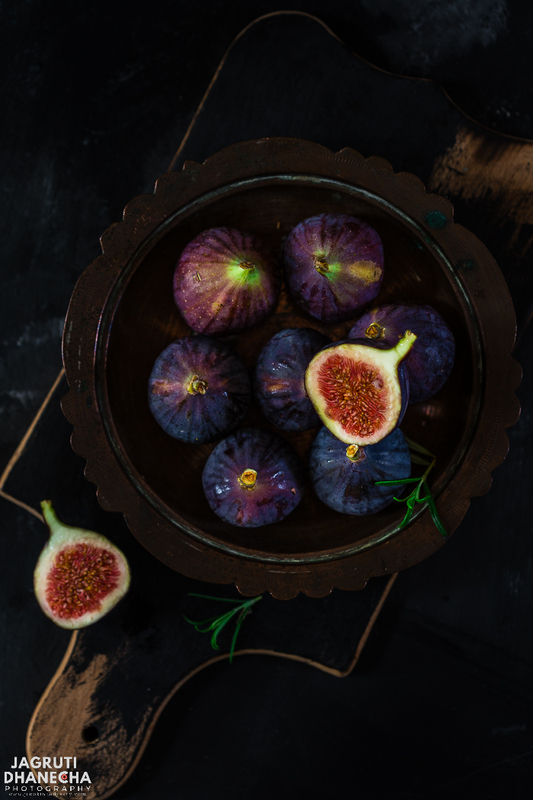 We adore figs, they appear for a very short season so while they are in the market, they come in our home too. We eat raw, we bake them, we marinate them. Add them in the yoghurt bowl, in the salad or eat it with Mascarpone as a dessert. 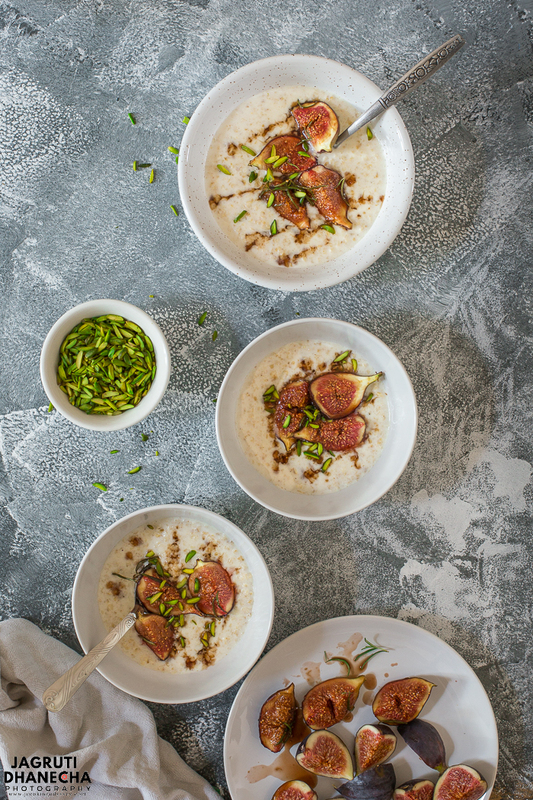 When your fridge is full of figs, you try to stretch your imagination and the next day wake up a little early and prepare this perfect autumn breakfast, a creamy tasting porridge, topped with roasted figs and rosemary and pistachio. If you are looking for a comforting, nutritious and filling breakfast recipe, you are on the right page. Basically, porridge is healthy, filling and cooked hot breakfast dish that is prepared with any grains such as Oats, corn or even rice. It is thick and creamy and can be cooked with milk or just water too or half milk and half water. Once it comes to dressing the porridge, it is extremely personal. Autumn and the winter is the best time to enjoy porridge when mornings are still dark outside and the rain is lashing the windows, and you want to warm up your inner soul too. 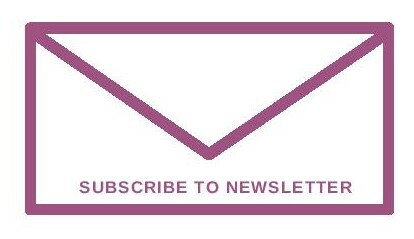 It depends on your personal choice, Rolled oats, Steel Cut oats, jumbo or Instant. Only the difference will be in cooking time and texture. Rolled and Jumbo oats give really chunky texture, Stell cut oats are creamy, delicious with little of bite in it, whereas instants give very smooth and creamy texture and require less cooking time. Here you are spoilt for choice, literally anything to everything, it just depends on your mood and availability of ingredients. Usually, most of the people like to top it up their porridge with a sweetener such as sugar, honey, agave or maple syrup, but you can jazz up your porridge with so many different other ingredients such as fresh fruit, frozen fruit, fruit compote or roasted fruit. Also add delicious nutty crunch by topping it up with seeds and nuts, or nut butter. Nowadays cacao nibs have become a favourite topping too. A warming and delicious breakfast, topped with roasted figs, mascarpone cheese and pistachio nuts. Preheat the gas mark oven to gas mark 6. Wash, pat dry and cut figs into four halves. 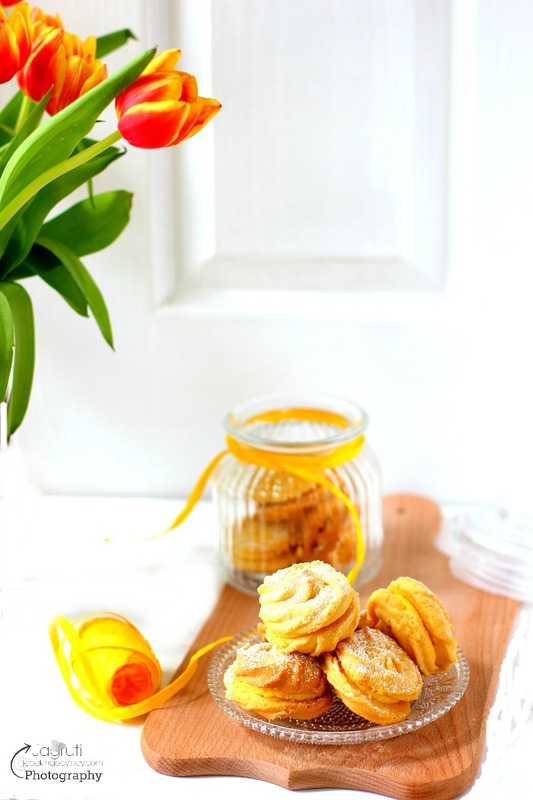 Place them on a baking tray with rosemary sprigs, sprinkle sugar and cinnamon powder. Place it in the preheated oven and bake for 5-7 minutes. Meanwhile, prepare porridge by heating milk in a pan. Remove from the heat, and stir in mascarpone cheese, serve into a serving bowl. Topped with roasted figs, sprinkle pistachio slivers and juice of the roasted figs. I would wake up early for this breakfast! How much mascarpone do you generally add? My husband and daughter both love figs so I will make this for sure. Ah Sandhya, thanks for reminding me, totally forgot to put mascarpone in the ingredients. I added 1 tbsp per person. The porridge is my hubby's favourite one. It looks so colourful and tempting. Soon I will try this one. Yumm!! Looks good enough to enjoy as a dessert too! Figs look so beautiful! Our neighbor in India always gives us so many fresh figs from his garden; I must try this the next time we get some! Fabulous share! This is such a lovely porridge preparation.. actually can be served as a dessert also. The porridge is my personal favourite breakfast. It looks absolutely delectable. I love your version and the simplified instructions. 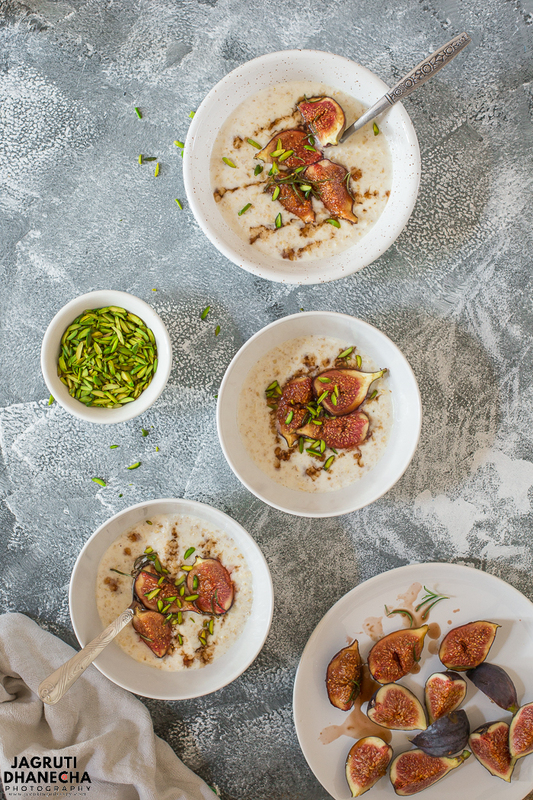 Adding mascarpone and figs to a simple oats porridge surely makes breakfast option so jazzed up who can say no to these lovely bowlful of goodness best way to start your day for sure. Looking at your porridge and the flavorful ingredients in it, renew the fussy eaters won't mind having porridge . perfect mroning breakfast with such a delicious oats and figs. Love the addition of mascarpone cheese in this. great share. Wow roasted figs in porridge sounds yum...I don't like porridge much, but the way you have described it wants me to have some now. The porridge looks scrumptious...I can’t say no definitely to this delicious breakfast...I’m curious to know why the figs are in discussion point of vegetarian or not? I love fresh figs, and try to buy them when I see them in the grocery store. What delicious way to start the day. My whole family loves oats porridge, simple, healthy, tasty and a perfect bowl of warm breakfast to jump start the day. I love the addition of figs here, figs are one of my fav. fruit. Your porridge looks perfect. I rarely fix oats or porridge but this does look so good! Love the figs!! Though I'm not a big fan of oats porridge, but looking at your pics and a perfect recipe, I think I should think again about my choice. Looks delicious. Amazing recipe!! Absolutely beautiful pictures! I adore oatmeal, grits, porridge - all of it! And for the love of figs...yes!! Seriously - I love everything about this recipe!! So heathy and nutritious! Figs are so beautiful, I wish fresh figs were more available in my area. This looks like such a good breakfast! Just the name of the recipe sound heavenly. Figs and mascarpone in one dish? yes please! This porridge looks so rich a creamy! I planted fig trees this year, so hoping next year I'll be able to make this! Thanks! I love everything about this recipe!!! The figs, the mascarpone, cinnamon, pistachios... all amazing by themselves and then so delicious together as a dish -YUM! Mmm, mascarpone in porridge isn't something I've ever tried but it sounds absolutely incredible. I'm absolutely certainly going to try this as soon as I can. Lovely pics and what a creative combination. I have never tried anything like this before. Pinned. I will try this soon.YUMMY!